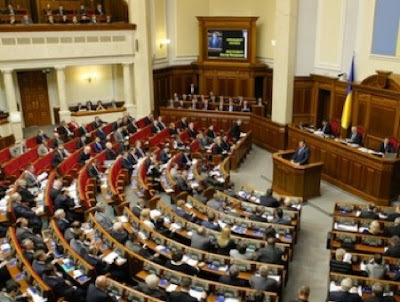 KIEV, Ukraine -- Parliament voted Tuesday to approve guidelines for drafting Ukraine’s 2013 budget, stipulating that it must be based on President Viktor Yanukovych’s initiatives and the government’s five-year economic reform program. Critics said the guidelines were tailored to restrict future lawmakers that will be elected in October parliamentary elections and that may be won by opposition groups. “Our position is clear,” Mykola Tomenko, deputy speaker of Parliament and a member of the opposition Batkivshchyna party, said. The government is supposed to submit the 2013 budget draft to Parliament in early September, and lawmakers have to approve the final draft before the end of December to make sure the government’s spending is uninterrupted in January 2013. What makes the 2013 budget drafting process unusual is that the budget – and economic policies it will shape - may be finally approved by a new Parliament that will be elected in October. Opposition groups may well win the elections and may start opposing Yanukovych’s economic and domestic policies, making it more difficult for the government to control the economy, opinion polls suggested. Batkivshchyna, the largest opposition party, is likely to score 25.6% of the vote, followed by the governing Regions Party’s 22%, according to the poll released Tuesday by Rating, an independent sociology group. Vitaliy Klishchko’s UDAR party, the second largest opposition group, would score 9.2%, followed by the Communist Party’s 7.6% and nationalist Svoboda party’s 4.4%, according to the poll. Rating polled 2,000 respondents between May 5 and May 14 with margin of error not exceeding 2%, according to the poll. The guidelines stipulate the 2013 budget must be drafted only by using the outline of economic and foreign policies contained in Yanukovych’s address to Parliament earlier this year, and the government’s 2010-2014 economic reform program. Tomenko said the guidelines suggest that the 2013 budget will be drafted exclusively by the presidential administration and the government, without involvement of lawmakers. “The authorities are trying to hedge themselves against the victory of the opposition groups at the upcoming elections,” Tomenko said. The guidelines forecast Ukraine’s 2013 economic growth forecast at 4.5% on the year, which is somewhat more optimistic than 4% growth forecast by the European Bank for Reconstruction and Development. Ukraine’s consumer inflation is forecast at 5.9% in 2012, while producer prices are expected to increase 6.3%. Budget deficit target is set at 0.8% to 1% of the gross domestic product in 2013, according to the guidelines. The pro-Yanukovych majority in Parliament earlier this year approved 2012 budget amendments that increase spending by 33.4 billion hryvnias ($4.14 billion) this year, mostly increasing payouts to poor people ahead of the October elections.